gives the ordinate of the retardation curve for the time t». 4. Repeat steps 2 arid 3 for other values of t and plot the retardation curve. words the vclncitv of retarded recoil. plot a graph showing the variation of the retarding force with respect to time, it is necessary to have a curve showing the variation of the recoil travel with respect to time, and the latter curvc is one of those which yet remain to be determined. To overcome this difficulty, the problem is considered in two stages. For the first 0.010 second while the powder gas pressures are acting, the loss in velocity resulting from the retarding effect of the springs will be relatively small and will be almost entirely due to the constant effect of the initial com-pression. The varying force due to the spring constant during this interv al of time will almost certainly be negligible but, if necessary, it can be approximated very closely. 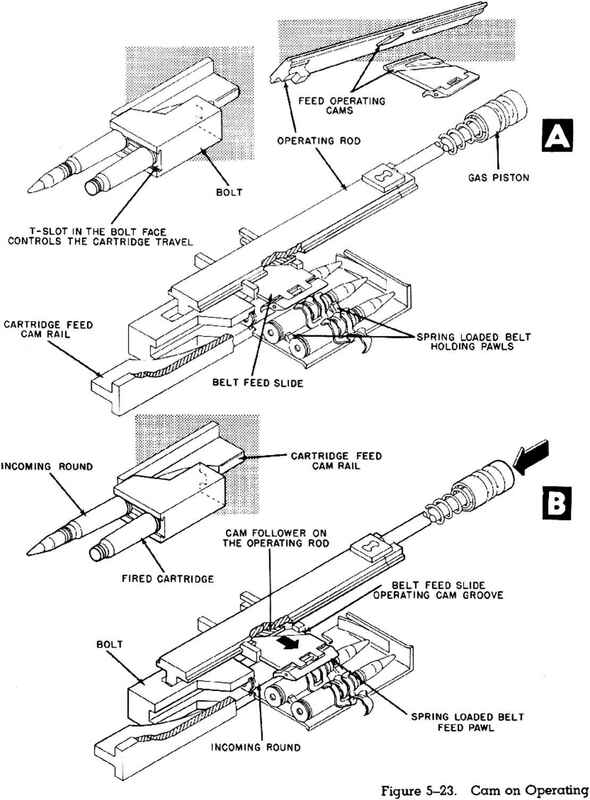 Tn this way, accurate results can be obtained for the first 0.010 second and for the remainder of the cycle of operation, while the powder gas pressures are not acting, the recoil travel can be determined analytically without any trouble. The procedure for plotting the velocity and travel curves during the first 0.010 second is as follows: 1. Plot curve of free recoil velocity versus time (fig- 2-1).